Walking poles, commonly called nordic walking poles and Urban Poling are designed to promote walking exercise, stability and balance while engaging specific muscle groups.They are an effective gait retraining tool for the purpose of rehabilitation. Some of the benefits of using walking poles include: exercises the upper body as well as the legs; improves posture; reduces stress on hips and knee joints; increases stability and balance; increases cardiovascular and calorie expenditure compared to regular walking; eases hill climbing and allows user to walk for longer distances with greater speed. 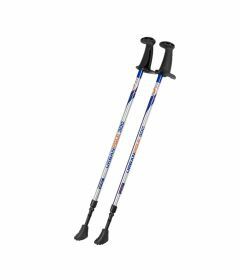 For the adult population who need more stability, walking poles provide balance and confidence while walking. The effects of pole walking on health in adults: A systematic review, provides scientific evidence on walking poles and rehab.